Our passionate teachers are always looking for ways to enhance their teaching practice and engage students in new and exciting ways. 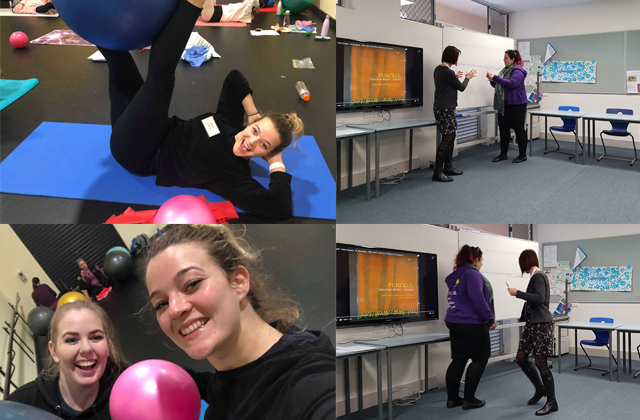 This term, some of our teachers participated in a variety of professional development opportunities, including giving up their weekends and school holidays! Miss Emily and Miss Rachel had a great time in Term 3 participating in workshops from the team at Progressing Ballet Technique. Joined by ballet instructors from around WA, Emily and Rachel learned new techniques in building core strength and improving alignment and movement efficiency. PBT’s focus on conditioning, stretching and developing awareness of the body improves dancers’ technique, flexibility and posture, as well as helping manage and prevent injury. We have enjoyed watching our students of all ages try some of the unique exercises and activities inspired by this method, helping dancers gain a deeper understanding of their bodies and improve their technique! Our studio manager and music teacher Sylvia Sippl spent the first six days of her school holidays attending Block 1 of 2018’s Australian Kodály Certificate course. Halfway through her studies, Sylvia is working to receive her AKC, a highly-respected tertiary qualification which covers teaching methodology, musicianship, conducting and choral repertoire. Joined by music educators from all over the world (including teachers who had travelled all the way from China and even the UK! ), Sylvia enjoyed a whole week of classes, assessments, and rehearsals, even learning alongside her own high school music teachers! Here Sylvia is pictured with Réka Csernyik, one of Australia’s leading experts in choral studies, and Co-ordinator of Kodály Pedagogy at the Conservatorium High School in Sydney during Musicianship class!